The number of students applying to early action and early decision schools has increased significantly over the years, according to Executive Director of College Counseling Canh Oxelson. Around 90 percent of seniors apply to a college before December 1st each year, Oxelson said. And additionally, in a recent anonymous poll conducted by The Record, 97.3 percent of 113 seniors who responded, reported applying to one or more schools under an early admissions plan. Almost half of all respondents applied to more than one school early, with 48.2 percent of seniors applying to one early decision school and one or more early action schools. “Kids are thinking it would be nice to have this over with, and one of the ways to do that is to be admitted to an early school, early action or early decision,” Oxelson said. Brooke Hailey (12) had this in mind when applying early to Washington University in St. Louis. 33 percent of seniors polled said that they decided to apply early decision to get the process over with. According to Oxelson, applying early does not mean that your GPA or test scores can be lower, despite the misconceptions of some students. Parul Sharma (12), who was accepted in the early decision round at Emory, paid close attention to this difference in application pool size. According to Oxelson, the number of early action applications has increased dramatically. “For early action, kids used to apply to a couple of early action schools, but now we see kids applying to five early action schools sometimes,” Oxelson said. Jazmine Smith (12) chose to apply to her first choice school, Harvard, via their restrictive early action program. Smith also applied to two state schools through early action. “UNC and UVA were two schools that I liked, so I figured I could find out about some colleges early rather than wait,” Smith said. 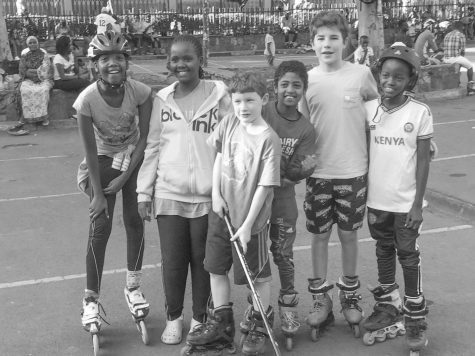 This increase in early applications is happening on a national scale. An article published in the New York Times on April 10th revealed that some colleges accept nearly half of their freshman class through early decision programs. For example, Duke University reported last year that they accepted just under 51% of their freshman class in the early decision pool. Among the seniors polled, which may differ from the official college matriculation statistics, 60 percent reported that they plan to attend a school that they applied to early. According to Smith, there was pressure from the school community to apply early. Chloe Bown (12) had similar motivations when applying to her early decision school. “I’d love to say that it was just purely because I was obsessed with the school that I applied to, but I definitely think knowing everyone else applies early i n f l u e n c e d me, especially because I am the oldest sibling and didn’t have much to base off of,” Bown said. The early decision process incited competitiveness between some students, Smith said. The regular decision round created a more relaxed atmosphere between students because many students had gotten in somewhere, Smith said. Some students would like to change the culture of the school community surrounding the early application process. Rahmin wishes that students would minimize the buzz around the subject and instead focus on what is best for them, she said. Bown and Smith, both of whom did not get accepted to their first choice schools, felt some disappointment in the winter, especially surrounded by many students who were admitted. 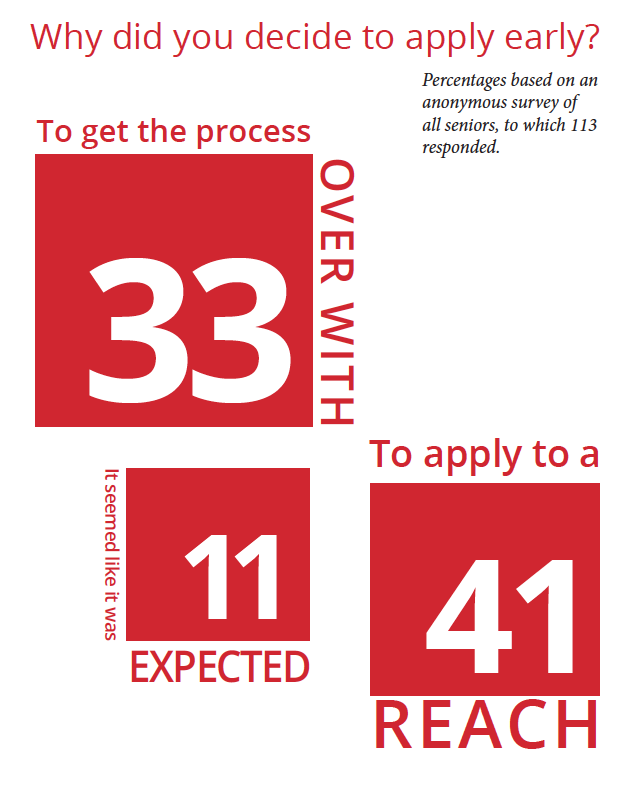 According to Oxelson, some students have regrets about where they applied early. Sharma, for example, had doubts initially about her early acceptance to Emory. In the end, Sharma was happy to be done with the process early, she said. Armand Dang (12) had a similar experience after being accepted early to the University of Chicago. “Definitely after ED I thought about ‘maybe I could have applied to other places,’ but I think that UChicago is a pretty good fit for me so no regrets really,” Dang said. From a developmental standpoint, forcing students to make a choice in November about where they will be spending their next four years is unreasonable, Oxelson said. However, he understands why colleges offer the choice. According to Gettysburg College Senior Associate Director of Admissions Darryl Jones, early decision is very beneficial for colleges. “The yield on acceptances to enrollees is one to one, admitted early decision students build enthusiasm for colleges at their schools and on social media, and we love admitting students who are competitive and who love us,” Jones said. Another important factor that many students must consider when deciding where to apply early is financial aid. According to Gabi Sheybani ‘17, applying early requires you to lock yourself into the financial aid package at one school before seeing how much aid other schools can offer you. Sheybani was accepted in Early Decision II to the University of Chicago, but she had to back out of her commitment after discovering that the financial aid package the school was offering her was not enough for her and her family. 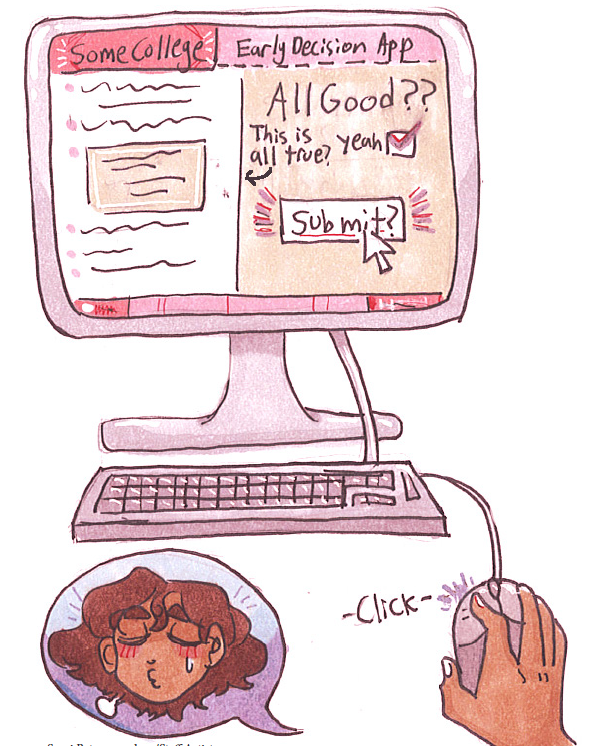 Sheybani wishes that she had had more access to information about financial aid earlier on in the process and that she had understood the important role that financial aid would play in her college decisions.